Kid Rock just turned 40 January 15th. 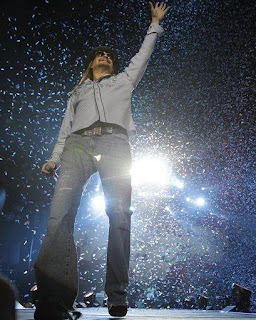 Kid Rock celebrated the day by having a 3 hour concert in his hometown of Detroit. The venue was the Detroit Lions stadium, Ford Field. During the show, looking over the 60,000 hometown fans, he said "I don't even know what to say...There is no place on earth I'd rather be right now than here." I tired to find time to review the new album, Born Free of Kid Rock back around its release date of November 16, 2010...but time got away from me. Maybe that's what Kid Rock had in mind for this album. The album is a continued departure from the rap-rock that made Kid famous. It's an album that harkens back to the late 70's / early 80's Americana that Kid Rock loves so much. Perhaps it's the time that he wishes hadn't gotten away from him? Rock churns out Southern Rock, a la Bob Seger or Tom Petty. Born Free is not as good as Seger's Night Moves or Petty's Into The Great Wide Open, but it is a great feel-good record that will get you through the cold months and into the summer. Kid Rock even convinces his idol, Bob Seger, to play piano on the song "Care" while he does the best raspy Seger-esque impression he can!